Really important server-wide changes were made this week! Amongst with them, RoA has finally recieved a rebalancing update. Thus, the work on Castle Wars continues! 1.8 is now partially supported! 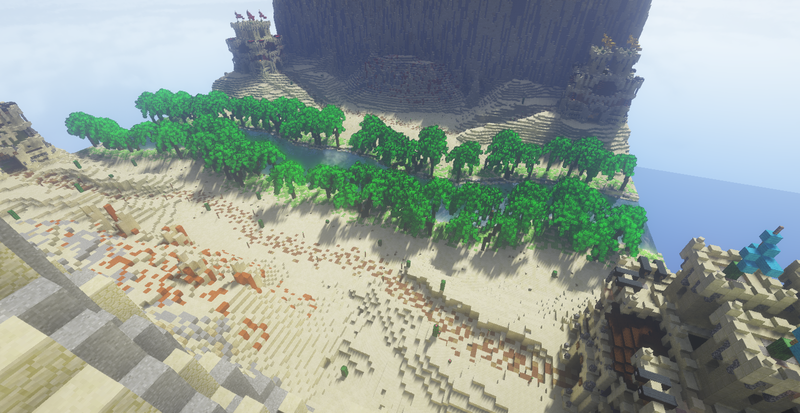 This was made to allow 1.8 players to take a look at the server and decide whether they want to play normally! You do not receive emeralds while playing on 1.8. Since the server is normally unplayable on 1.8 because of lots of incompatibilities and some unfixable bugs, 1.8 version won't be fully supported. Friendly Survival and Old-school Survival gamemodes are now available for cracked players! Server-wide Enchanting System was changed to vanilla 1.9 one. You no longer take damage while a script is reloading. The №2 voting link was changed to minecraft-server.net. Top 3 monthly voters now receive their rewards automatically! Logout in combat is now handled better. Player warping now functions better. Command buttons can target individually selected unit types instead of all selected units. Pressing 1 while hovering your cursor over target priority: Creepers, will ONLY set your selected Archers' target priority to Creepers. Pressing 2 would result in the same activity done for Swordsmen. 0/10 means that NONE of your units are set on this action right now. 10/10 means that ALL 10 of your units are set on this action right now. Castle Wars performance was drastically improved overall. 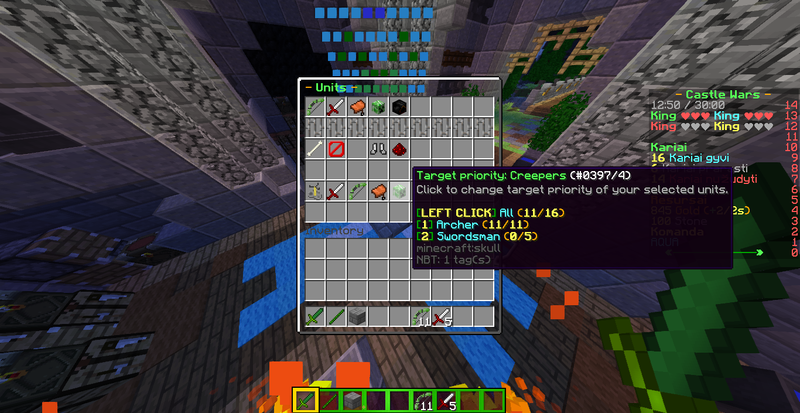 Archers in Castle Wars can now shoot to the location you're looking at by using DROP key action on their hotbar item. You now receive XP from kills again. But that happens only if the player and the mob are 3+ levels apart. It will give you the same amount of XP as your level on a kill. Death messages are now handled better in GSG. GL-240 Wizards swim really slow in 1 block water in Castle Wars. GL-241 Archers try to shoot through 1 block walls in Castle Wars. GL-242 PMC isn't supported by the server's votifier. GL-244 /vote command formatting and clickability is broken. GL-245 The creative world is full of null plots. GL-246 GameBox's leaderboards are full of unknown players. 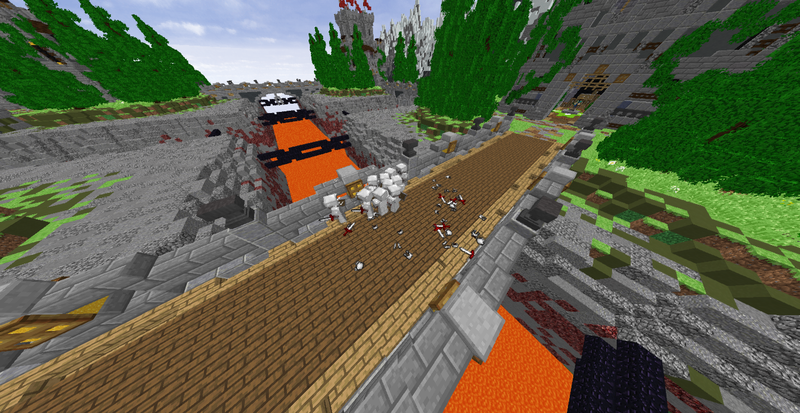 Castle Wars update spree continues (with a pinch of Friendly Survival and other stuff)! Tons of improvements, optimisations and bugfixes await you! This will greatly help players with connection problems to not get kicked. /tps command is now available for all players, so it's now possible to check if that it is the player lag which is intact or it is the server lag. The voting menu in all minigames no longer automatically opens. There is now an XP progress bar showing when you can poop in the Main Lobby. Payment methods were updated in our webstore, now paying via cards is possible using PayPal. Sign item functionality was merged with wood sword functionality. Sign Item was removed completely. When you select hotbar item for the first time, it will now tell its usage in the chat. Training queue slots were moved down so they are more noticeable and not hidden by lore. You are no longer forced to fly. You can now move units closer to the enemy's king. Draw timer was added to the scoreboard. Combat AI was massively optimised. Unit selection system was optimised. Horse mounting system was optimised. Troops death system was optimised. Creepers AI Remake & Changes! Creepers which are on aggressive stance will now walk to the nearest enemy and explode. But they will only walk to walls on stand Ground Stance. Walls are a higher priority than enemies. If a Creeper is walking to a wall, they will ignore other targets. 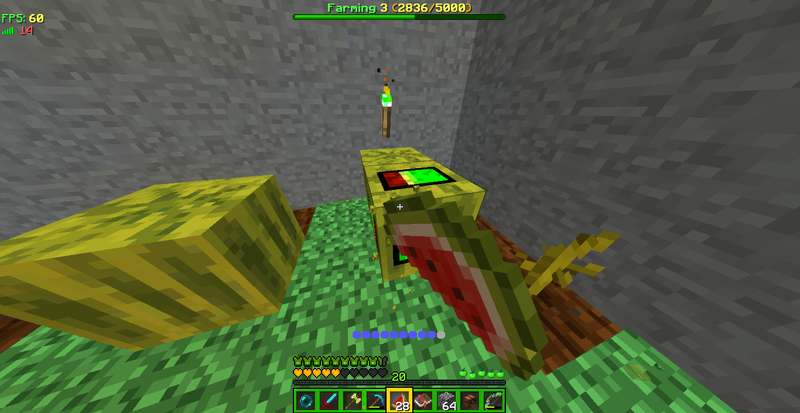 Creeper speed was increased a little bit. Archers aiming now works as in the real world! It now uses ballistic movement! Archers now shoot at a certain angle to reach enemies located further from the player. Archer arrow speed was decreased. All troops now regenerate 0.25 ❤ / second. Wizard's health loss was decreased. More light around castles and roads was added. Made all chains climbable to be fairer for all sides. Amount of entities flowing in the river in Oasis map was reduced. Emblem editing (/emblem) in-game now updates Emblems every 5 seconds, no longer requiring new game start. This system will gradually take over all gamemodes! It prevents tips which you have seen recently from being shown. Tips are dependent on the world, so different dimensions may tell you different useful information! Tips are sent every 5 minutes, if you have seen all the tips recently, none will be sent. Tip of a possibility to track world spawn is now shown when you execute /spawn. Realistic Water Mechanics plugin's performance received a giant boost update. Realistic Water Mechanics work much smoother now. /survivalrules command is now coloured differently than the other message. The formula for points needed to win in some of Elemental Archers modes was changed from players * 25 to players * 15. Dying multiple times in a row no longer reduces points in the Juggernaut mode in both Snowball and Elemental Archers. Spawn protection was removed in Juggernaut mode in both Snowball and Elemental Archers. GL-226 Creative World stuff conflicts with Castle Wars. GL-227 Horse archers do not have bow charge animation in Castle Wars. GL-228 Horse archers shoot x2 faster than normal archers in Castle Wars. GL-229 Most troops are unable to regenerate in Castle Wars. GL-230 Creepers do x2 more damage than they should in Castle Wars. GL-231 You can put items into your second hand in Castle Wars. GL-232 Spawn movement is buggy in Castle Wars. GL-233 You can fly in Main Lobby if you exit server while in spectator mode. GL-234 Creepers do not spawn in The Mining Camp. GL-235 You can shoot with a bow in Castle Wars. GL-236 Mobs deal double damage in the Realm of Almarath. GL-237 Units walk in a circle if you tell them to move further than the pathfinding limit (100) in Castle Wars. GL-238 Palms of Tree Growth System have glass/cocoa bean in wrong places when they grow. GL-239 Archers can pick up loot in Castle Wars. Summary [3/3]! Giant Castle Wars Update and Sprays [Beta] release with a pinch of bugfixes! The map has a River in the middle with actual simulated River flow! You can see leaves and similar stuff flowing in the river! Units can now easily walk in 1-meter deep water. Units slowly swim in 2+ meter deep water. All units now have a new awesome Pathfinding AI! It is much smarter and units no longer get randomly stuck on blocks. Units can finally walk long distances without getting stuck and walk on rough terrain. Also, the Pathfinding AI was optimised overall. They are made that way which won't spam the chat. Death messages are sent with a 5-second cooldown to prevent spam. Example of the message: "Wizard has killed Archer (x10)"
Archers now deal more than x2.4 less damage. The velocity of shot arrows was increased. Stand Ground stance is now enabled by default for archers. Custom bow charging animation system! They now charge their bows in synchronisation with shooting arrows. Archers now don't always have 100% accuracy. First arrow shot is less accurate than the next ones. Archers are unable to shoot while swimming. First and most importantly, Horse Archer AI now works. Horse Archers can now shoot while being moved by the player. You can just move them around the enemy castle at high speeds and have enemies eliminated, they are awesome for quick and fast-paced attacks. Wizard's arrow blocking ability now has 3 block radius (2 --> 3). Wizards now lose less health from the ability above. Wizard will no longer use magic when his health is too low to avoid death and regenerate health back to normal. Gather point selection was added. Use DROP KEY with a wooden sword to open it, afterwards select unit and their gather point will be set to the block you were looking last at. Unexpectedly, units would gather at that point. All blocks above sold wall now get sold. Bricks are now unplaceable above air blocks. Day and night cycle was introduced! Troop fall damage was reduced by x2. GUI error buttons are now much easier to understand. Example: "Not enough gold!" message would stay on screen until there would be enough gold, instead of disappearing after 0.5 seconds. Spray is a 128x128 image, completely fitting into a Minecraft map. You can use sprays in any minigame, lobby or in Parkour. Sprays placed outside minigames disappear after 30 seconds. Sprays placed in minigames are kept until the game end. Sprays are a VIP-only feature. Sprays can be used by pressing the SWITCH HANDS button. GL-214 Voting for special maps doesn't work in Snowball and Govindas SG. GL-215 Double chests do not generate items properly in Govindas SG. GL-216 Line formation prevents units from going through the bridge. GL-217 Slimefun trees appear in Castle Wars map. GL-218 King of the Castle drops his sword on the game end. GL-219 Emblem drawing doesn't work. GL-220 You could place wall blocks outside your area. GL-221 Blocks outside your area are not being properly reset. GL-222 If a player stands directly inside a troop, archers cannot kill that troop. GL-223 Arrows can not go through horses of teammates. GL-224 Many troops try to mount the same horse. GL-225 Troops killed stat isn't being reset at the start of a new match. Summary [2/3]! Lots of bugfixes, Quality of Life improvements and, most importantly, Emblems and Castle Wars updates! You can now place bricks the vanilla way. Breaking blocks sells them back for 1 Stone. Old building method is still available, but to use it, you have to press SNEAK. When a troop is killed, he now drops parts of its equipment on the ground. It disappears within a minute or after a certain limit is reached. The player's emblem is now shown above the king. You can draw your own Emblem (of 10x10 size, 100px in total) by using /emblem. You can use the command anywhere in the server! Emblem of a player is displayed in the scoreboard, when you enter their land, for 5 seconds. Also, it's shown above the king in Castle Wars. You can click anywhere once to remove it quicker. The Emblem is not displayed if the player has not created their Emblem yet. Wither spawning was disabled in Creative World. The levelling system was rewritten in Friendly Survival. Level progress (Farming, Mining, Hunting) is now shown in the bossbar instead of action bar in Friendly Survival! Now there is a bossbar, showing server's IP, which appears in most games apart from Survivals. Bossbar now shows Juggernaut Health in Snowball and Elemental Archers. Phantom shield blocking in 1.8-like combat was removed server-wide. GL-206 Wizards block allied arrows. GL-207 Left clicking with an item is not properly registered. GL-208 Juggernaut is not being set properly on a kill in Snowball and Elemental Archers. GL-209 Phantom armour bars appear after Snowball games. GL-210 Custom damage of items doesn't work at all in Govindas SG. GL-211 Some stats aren't saved with logout kills in Govindas SG. GL-212 Armour bars reduce damage in the Realm of Almarath. GL-213 Ability PvP killstreak armour is infinite, meaning you can reach damage reduction above 100%, healing the player. As an excuse for a long wait, we publish not one summary, but three of them! [1/3] Enjoy! This week: Portuguese language support, Decoration Heads and Parkour QoL changes! Portuguese language support was added! Giant thanks to TugaG4mer for translating server content to Portuguese! Furniture names are now in a better format. Leaderboards were added to every parkour, showing best times. Anticheat now supervises and records all parkouring players, completely eliminating unfairness in parkour. There are now Old Record and New Record appearing when you beat your last record. "Old Record" and "Wins" lines were added to the scoreboard. /resetparkour now teleports you to start of the parkour instead of teleporting to the Lobby. ExoticGarden Slimefun addon was updated in Friendly Survival, bringing to us a new machine: Kitchen. You are now forced to read rules in Friendly Survival / Old-School Survival to be able to break/place blocks. Realm of Almarath mob spawning system was rewritten and optimised. The Mining Camp creepers spawn system in The Creeper Cave is now bugless, lagless and much faster! GL-203 Time elapsed is not being shown properly in the scoreboard. GL-204 ExoticGarden plants incorrectly spawn/respawn/break. GL-205 Players disappear from the tab list if you turn off player visibility in Parkour and The Mining Camp.